I don’t know if you are familiar with this organisation called “United Nations”. It is an organisation which formed in 1945 after World War II to promote peace and security in the world. The United Nations Council has five permanent members (China, France, Russia, UK and USA) with another ten non-permanent members. If you are interested in who they are, you can visit their website www.un.org. I am not interested in world politics before but recent events lead me to know about United Nations. Let me give you the background stories and why I think the UN is a joke. The sequence of events are. 4th April – A hundred people killed by chemical weapon in Syria and USA blamed the President of Syria (Bashar Al-Assad). 6th April – Donald Trump (President of USA) ordered a strike on Syria air base with 59 Tomahawk missiles without any evident that it is done by Bashar Al-Assad. 7th April – President Putin of Russia said the US strikes on Syria as aggression against a sovereign state in violation of international law and illegal. 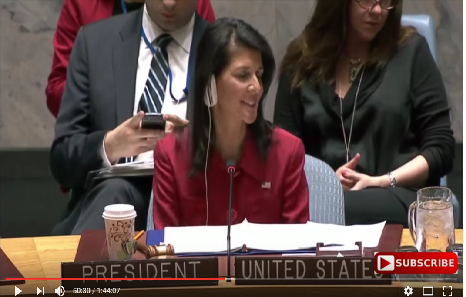 7th April – UN held urgent council meeting to discuss US air strike in Syria. Here is the recording of the meeting. It is interesting to know what they talked about and I wonder how will they solved the problem. Could UN bring peace to our world? What do you think? Why I said United Nations is a Joke? How would anyone promote justice if there are no one who has more power than the offending party? For example, if within a country the King of the country did something wrong. Would anyone be able to punish the king who has esteem power? It won’t be possible. For example, if USA really did something illegal. Would other nations be able to punish them? I don’t think so. Therefore, it is meaningless to hold such meeting, a total waste of time. There has to be a entity which has more power, otherwise it is a joke to host such a meeting. There are other proofs that the UN is not doing it’s job, or should I say UN is a useless organisation. Here are some of the problems that they will never be able to solved. It is because some countries don’t want to solve these problems or they are unable to do anything. We have 195 countries in our world today. If we can REALLY work together, these problems are not hard at all. If we cannot work together, forming such an organisation like the UN is a waste of time. I will give you an analogy. For example, we have a house and 10 persons live inside. The house is never clean, because some always mess up the place. No matter how hard the others tried to clean it up, it will never be cleaned. The only way is to kick out those who don’t cooperate. Until then, the house will never be cleaned. It is very obvious that which is the offending party in our world. Or more directly, which nation is causing all the problems in our world. I will give you a little hint – the KING. I deduced this conclusion using logic. You might want to ask me, why the king want to do this. The answer is very simple – stupidity. You can refer to my other post which are will give you the reasons – The Stupidity of a Dictator. I love to study about human behaviours. It is because I like to know how people will behaviour in different situations. I like to know why people do what they do. There are many sources and study materials. You can learn from books or movies. If you want to be a wiser person, keep learning. Also, don’t be judgemental and stubborn. When you learn something good, you have to throw away the old ideas which doesn’t hold true. Something true today might not be true tomorrow. You might not agree with me on this. I give you an example. We believe in working hard before, our parents used to tell us that hard work will produce good results. But now we understand that we have to work smart rather than just working hard – you can be lazy and still produce good result. You can see that there are lots of poor people who work more than 16 hours a day, but still struggle to make a living. Let us get back to the UN topic. How are we going to solve the problem in our world? I would say UN is not a solution. Negotiation could only work on people who are logical and reasonable. Sometimes, force is the only solution. Here is a verse from the Bible. A foolish person would never understand that what he is doing is foolish. No matter how hard you try and he will not listen. Only a wise man can see the foolishness. Would a foolish man becomes wise?